The aim of this study was to analyze the potential impact of chemotherapy-induced nausea and vomiting (CINV) on dose reductions, discontinuation of chemotherapy, and survival. This study was designed as individual participant data meta-analysis with the original study data of three phase II/III trials that were conducted by the North-Eastern German Society of Gynecological Oncology (NOGGO) including 1213 patients with recurrent ovarian cancer. Logistic and Cox regression analyses were used to estimate odds and hazard ratios after adjusting for age, ECOG, amount of delivered cycles, amount of recurrences, and amount of comedications and study. The majority of patients developed nausea (58.1%) and almost one third experienced vomiting (31.0%). CINV was not associated with FIGO stage, grading, histology, and number of recurrences. The necessity of dose reduction and discontinuation of chemotherapy did not correlate to nausea and vomiting (p = 0.88, p = 0.39 and p = 0.25, p = 0.54 respectively). Progression-free survival was shorter in patients with grade III/IV nausea and vomiting (p = 0.02; hazard ratio (HR) for grade III/IV nausea 1.58, 95% CI 1.14–2.20, and p = 0.02; HR for grade III/IV vomiting 1.67, 95% CI 1.15–2.42 respectively). CINV grade III/IV was also associated with poorer overall survival (p < 0.001; HR for grade III/IV nausea 2.35, 95% CI 1.64–3.37, and p < 0.001; HR for grade III/IV vomiting 1.67, 95% CI 1.15–2.42 respectively). CINV is significantly associated with poorer prognosis in recurrent ovarian cancer patients while there was no correlation found with the necessity of dose reduction and prior discontinuation of treatment. This study underlines the importance of prevention and treatment of CINV as part of early best supportive care. Parts of the results have been chosen for abstract publication related to the ASCO 2017: Woopen H, Richter R, Inci G, Chekerov R, Oskay-Oezcelik G, Sehouli J. 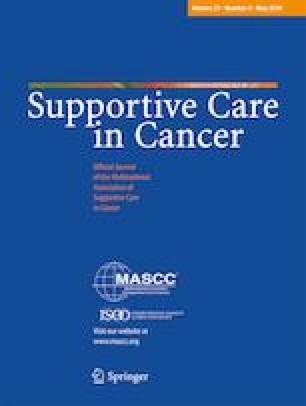 The influence of chemotherapy-induced nausea and vomiting (CINV) on survival: an individual participant data meta-analysis of the North-Eastern German Society of Gynecological Oncology (NOGGO) of 1213 recurrent ovarian cancer patients. J Clin Oncol 35, 2017 (suppl; abstr e17062). Prof. Sehouli has received research funding from GlaxoSmithKline. Dr. Hannah Woopen, MSc was a participant in the Charité Clinical Scientist Program funded by the Charité Universitätsmedizin Berlin and the Berlin Institute of Health.